Is that a new collection from my favourite haircare brand? YES it is! 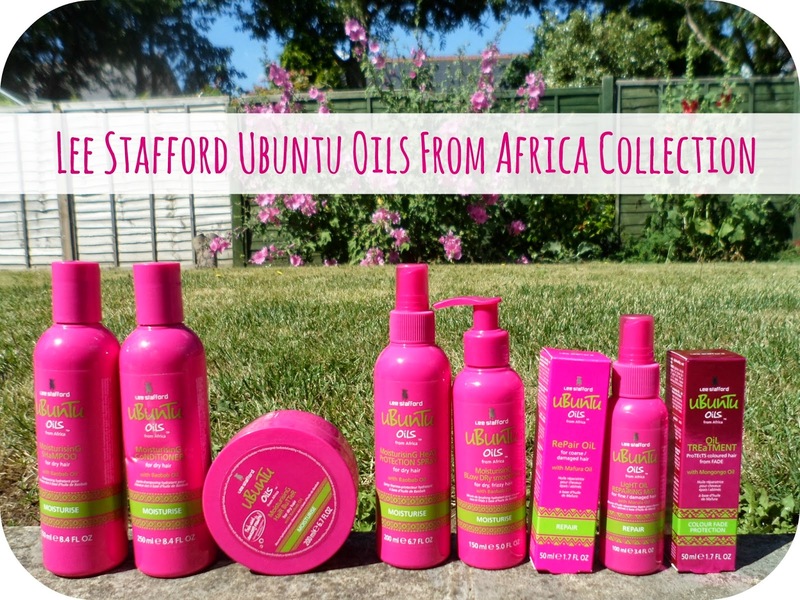 Lee Stafford has done it again with a new range of products featuring some of Africa's most fabulous oils! Sit back, relax and have a read about what I think of them. When I heard and saw the new collection from my favourite LS I knew that, 1. needed to try them and 2. I would probably love them no matter what! If you've read my blog for a while or seen haircare posts before on here you will know how much I love LS products and they are always the first on my list to recommend! We'll start off with the in-shower products - the moisturising shampoo, moisturising conditioner and moisuising hair butter! These are all infused with the Baobab Oil which is for dry hair - perfect for me as I bleach my hair and always need a bit of extra TLC especially after styling! *Fact time* The oil is taken from the African Baobab tree which is known there as the 'tree of life', it contains vitamins E and A and is extremley moisturising! Not only have I been loving the shampoo and conditioner's results BUT the smell is out of this world! If you are a lover of sweet scents then this is the stuff for you - and this goes for all of the products I'm featuring the scent is up there with my favourite produts scents ever! AND it really does last on your hair, especially if you are laying it with in-shower products followed by styling and protecting products, a couple days later and I can still smell it! Now onto the product you are probably all intrigued about, the Moisturising Hair Butter. The word butter just screams moistuising but normally not on your head! Like it says on the packaging "feels weird, amazing results!" this is so true. This stuff feels just like a thick, rich, creamy body butter - alot different to your bog standard hair mask or treatment! You pop this on after shampooing your locks and leave for 5-10 minutes.... in this time I like to de-fuzz, use a few snazzy facial products, pretend I'm a popstar and chill out.... after this time is up you just rinse it out and slap on the conditioner before rinsing out and finally getting out of the shower! This stuff feels lovely, I've been using it once or twice a week and it has been leaving my hair feeling hydrated and shinier than ever! Now onto two of the products I've been using when styling my hair! These are also the other two products made with the Baobab oil! Recently I seem to be a styling my hair slightly more often than usual, for the last 18 months or so I've tried to cut down the amount of heaat I use on my hair just becuse I have been on a strict mission to grow out my bob - which has totally worked, my hair is now way past my collarbone - yay! Anyway back to the products! First the Moisturising Heat Protection Spray - a must for anyone and everyone (especially in summer)! Like I mentioned before the scent to this is amazing and using this helps keep the smell strong in your hair! Using a heat protection spray always makes me feel less guilty about the strain and heat I put on my hair during styling! The other Baobab oil product is the Moistuising Blow Dry Smotheee! This creamy oil is to be popped on towel dry hair before the joys of blow-drying... obviously! I just grab 3-4 pumps and rub it through my blonde locks from root to tip and comb through! Now a repair product, which is just as important to me as moisturising! This is the Light Oil Repairing Mist for fine/damaged hair made with Marula Oil. *Fact time* Marula oil is rich in antioxidants and is one of the rarest healing oils from Africa. It is a light oil which is easily absorbed so no thick and heavy residue left on your hair, which means it won't weight it down so it's great for when you want to add some of this to dry hair! This is fab for using for those days after your hairs had alot of styling or heat put on it and it's feeling a bit damaged and in need of some TLC! I cannot wait to take this to Florida with me, I think it's going to be a lifesaver for the hot climate and constant sunshine! Last but not least we have the hair oils! Hair oils are just a daily part of life now aren't they? Like really.... wat did we do before them? My poor barnet! I've have been trying out two - the Repair Oil for coarse/damaged hair and the Colour Fade Protection Oil Treatment. My hair is both damaged and coloured so it's been hard deciding on which one to go for each time! The Repair Oil is made with Mafura oil. A rich textured oil which is taken from the kernel of the mafuna fruit - snazzy huh?! I've loved finding out about all these different ingredients, very interesting and fun to be using something that isn't moroccan/argan oil! I'm really liking this oil, I've been using it when after I've washed my hair from my mid-lengths down instead of my usual aray of oils, it feels really thick and luxurious on my hair and has helped keep my ends from feeling limp and dry on a daily basis. The Colour Fade Protection Oil is infused with yet another oil oil from Africa - Mongongo oil. This is said to have been used by people for thousands of years as a body rub to protect skin against sun damage in harsh dersert environments. 'It reacts with UV light to polymerase into a protective layer' - so high-tech I'm impressed! Rich in Omega 6 this stuff is perfect for keeping your hair hydrated and obviously helping keep your fabulous colour. This is 100% the oil I will be packing for my holiday - an oil and a UV protector in one which smells amazing and saves space in my suitcase too - yay! My hair has felt fabulouso for the last few weeks, Lee Stafford remains as my favourite master of the hair! The Unbuntu oils from Africa products range from £9.99 to £12.99 and are available exclusively at good old Boots - here! This stuff looks AMAZING! I must try. Really looks an amazing brand, totally got me curious. This is such a brilliant post. I really like the look of the Blow Dry Smootheee, it definitely sounds like something that would be useful in my every day hair routine.